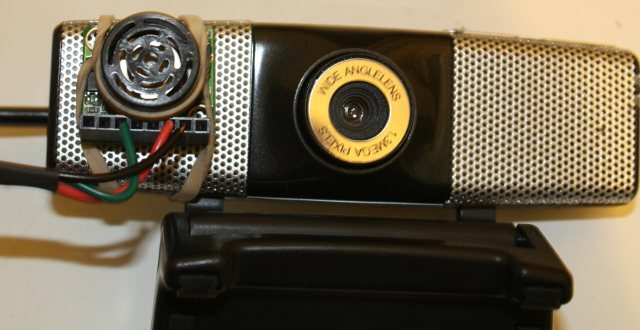 In the last article, I wrote about how to get a very simple webcam demo running on a plug computer, also known as a Sheevaplug. Okay, a webcam is sorta cool, but it's still a pretty easy thing to do from any laptop. I wanted to demonstrate some lower-level hardware control. As I mentioned in the previous article, trying to run hardware directly from a plug computer is an exercise in frustration. So what do you do when you want to drive low-level hardware? Use an Arduino, of course! 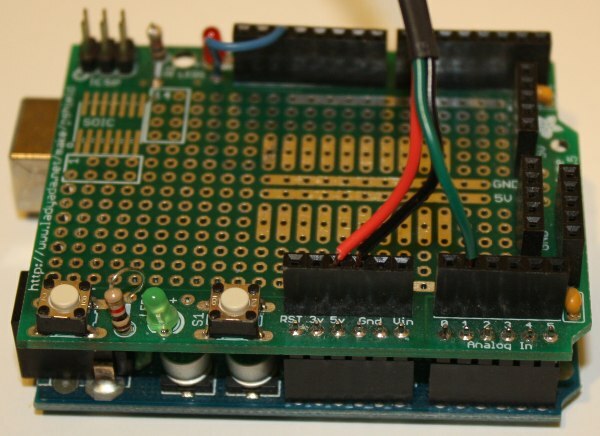 Happily, the sheeva.with-linux kernels include the FTDI driver you need to talk to an Arduino. So you can plug the Arduino to the plug computer, then let the Arduino read the sensor and write its value to the serial port, which you can read on the plug. First I tried a simple light sensor from Adafruit, using the circuit from the LadyAda photocell tutorial. 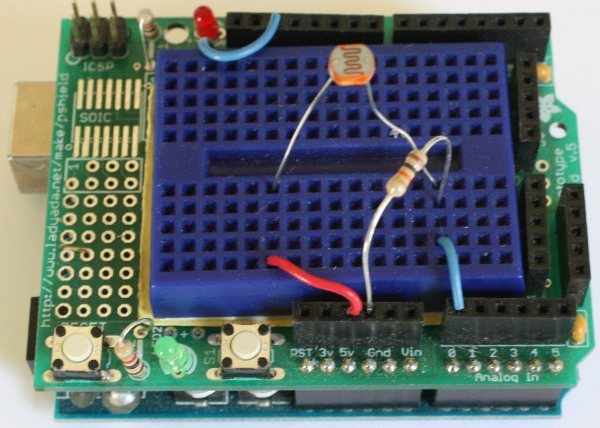 I wrote a very simple Arduino sketch to read the analog output: lightsensor.pde. I'm allergic to Java IDEs, so I compiled the sketch from the commandline using this lightsensor Arduino Makefile. Edit the Makefile to point to wherever you've installed the Arduino software. Now, on the plug, I needed a Python script to read the numbers coming in on the serial line. I ran apt-get install python-serial, then wrote this script: readsensor.py. The script loops, reading the sensor and writing the output to an HTML file called arduino.html. Visit that in a browser from your desktop or laptop, and watch it reload and change the number as you wave your hand or a flashlight over the photocell. Pretty cool ... if you're extremely geeky and have no life. Otherwise, it's maybe a bit limited. But can we use this Arduino technique to do something useful in combination with the webcam exercise? How about an ultrasonic sonar rangefinder? I ran power and ground wires to 5v and Gnd on the Arduino, and a wire from the rangefinder's analog out to the Arduino's Analog In 2. A little heatshrink keeps the three wires together. Then I rubber-banded the rangefinder to the front of the webcam, and I was ready to test. Use a sketch almost identical to the one for the light sensor: rangefinder.pde, and its rangefinder Arduino Makefile. I used pin 2 so I could leave the light sensor plugged in on Pin 1. Now I ran that same readsensor.py script, paying attention to the numbers being printed out. I found that they generally read around 35-40 when I was sitting right in front of it (camera mounted on my laptop screen), and more like 150-250 when I got out of the way and pointed it across the room. It also rewrites the HTML file to display the value it read from the rangefinder, though that part isn't so important. Put it all together, and the proximity-sensitive camera snaps a photo any time something is right in front of it; otherwise, it keeps displaying the last photo and doesn't snap a new one. Sample uses: find out who's using your computer when you're away at lunch, or run a security camera at home, or set up a camera to snap shots of the exotic wildlife that's visiting your feeder or research station. You could substitute an infra-red motion sensor and use it as a motion-operated security camera or bird feeder camera. I ordered one, but got bogged down trying to reverse-engineer the sensor (I should have just ordered one from Adafruit or Sparkfun). I'm happy to say this all worked pretty well as a demo. But mostly, it's fun to know that I can plug in virtually any sensor and collect any sort of data I want. Adding the Arduino makes the plug computer much more fun and useful.